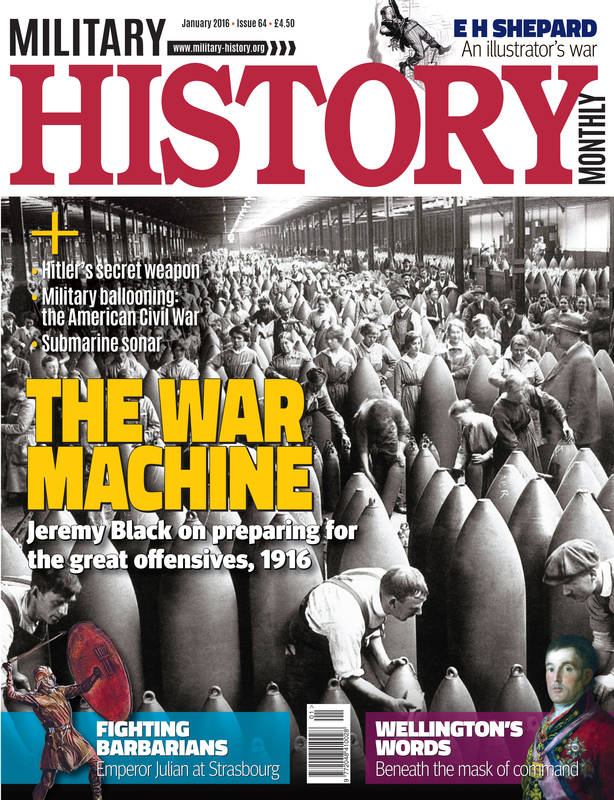 The January 2016 issue of Military History Monthly, the leading British military history magazine, is on sale now. David Porter reveals the human being behind the Iron Duke’s ‘mask of command’. Marc DeSantis recalls the career of Julian the Apostate and his victory against the Alemanni at the Battle of Strasbourg in AD 357. Dave Sloggett reviews Hitler’s V-2 campaign in light of later history. MHM looks at a photograph of the soldiers of the Union Army Balloon corps inflating the balloon Intrepid in 1862. Patrick Boniface assesses work of inventor Louis Nixon. MHM examines the war illustrations of E H Shepard. Taylor Downing marks the 75th anniversary of the winter of the Blitz with a review of Fires Were Started. Editor Neil Faulkner reviews The Fall of the Ottomans: the Great War in the Middle East by Eugene Rogan. Jules Stewart reviews Reckless Fellows by Edward Bujak, Francesca Trowse reviews Karl Doenitz and the Last Days of the Third Reich by Barry Turner, and Guy Taylor reviews Waterways on the Western Front edited by Celia Halsey. George Clode travels to Guernsey in Italy to visit the German Occupation Museum. The best military history events coming up in January. All you need to know about Leon Trotsky. After a spike of interest around the centenary of the outbreak, public interest in the First World War has been at fairly low ebb through 2015. This is likely to change next year, with the anniversaries of the Somme, Jutland, and Lawrence of Arabia. So we lead this month with an analysis of the shift of gear in the winter of 1915/16. The campaigns of movement in the late summer and early autumn of 1914 had quickly morphed into trench stalemate and attrition by the year’s end. But the resources for sustaining this kind of war simply weren’t available. Offensives were too underpowered to have any chance of breaking through. Industry could not provide the guns and shells needed. The transition to ‘total war’ had not been made. Welcoming Jeremy Black as a new contributor to MHM, we invited him to explore the transformation of war between 1915 and 1916 in preparation for the great offensives to come. His overview is supported by MHM regular David Porter’s case-study of the planning and preparation for Verdun, the first of those offensives, launched in February 1916. Also this issue, we have Marc DeSantis’s account of the Roman Emperor Julian’s great victory over the Germans at the Battle of Strasbourg in AD 357, Dave Sloggett’s assessment of Hitler’s V-2 rocket assault on Britain in the last year of WWII, and, again from David Porter, a look at the man behind the mask of the ‘Iron Duke’, using his own words.